Cruising the expanse of road that leads you through Gregory Vineyards and up to the tasting room gives you time to take-in the idyllic view. Rows of grapevines stretch out over an expanse of green grass as it slops gently towards the calm waters of a large pond. It would be easy to sit and rest on the porch with a glass of wine with nothing to do but soak-up the autumn sun. If you have been following along on the Meet the Makers blog series then you know by now that North Carolina has almost 200 wineries and a booming wine industry that not just locals but visitors, from all over the nation and world, enjoy. You also know that Johnston County has talented artisans working in various industries; JoCo can now boast 2 wineries, 2 craft breweries, and a moonshine distillery. Tourists can visit all 5 establishments on our Beer, Wine, and Shine Trail and many visitors are led to the county by other beer, wine, and spirit trails that extend across the state. It is because of this growing relevance between beverage crafting and tourism that I started Meet the Makers. In this installment of the blog series I sat down with Lane Gregory, owner and winemaker at Gregory Vineyards to discuss what he does every day and what&apos;s around the corner for the vineyard. One of the first things Lane told me about Gregory Vineyards is that the grapes were originally meant to be ornamental, "a winery was not the purpose of the vineyard. I put the vineyard in as a backdrop for weddings." To clarify, in 1987 the Gregory&apos;s opened Lane&apos;s Seafood, a delicious restaurant that enjoyed many years of prosperity. Then, when Lane wanted to spend more time with his children, he left it in the care of a couple who just couldn&apos;t manage it like they thought and the restaurant closed for a time. In 2009 the Gregory&apos;s reopened the restaurant building, on their beautiful land, to host weddings. The vineyards were planted at that time because Lane thought they would make an excellent backdrop to the weddings and the guests who came to the restaurant to dine. But, when you plant vineyards you are also growing grapes as Lane pointed out, "We had to do something with the grapes. In 2011 the winery opened. We have 12 acres now and we run a small but successful operation." 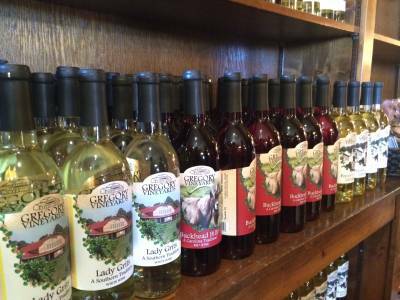 Gregory Vineyards produces award-wining muscadine wines. When asked why he doesn&apos;t make a merlot Lane says it&apos;s due to the Eastern North Carolina climate. Not all varietals do well, but muscadine grapes flourish and 2014 was a bountiful harvest, making 2015 an excellent wine year for Gregory. Lane says he expects that 2015-2016 will be similar. Lane plans to expand the vineyard, planting 8 more acres within the year and eventually hopes to add between 20 and 30 acres. Expanding the vineyard means expanding production. The Gregory&apos;s still sell almost 100% of their wine on-site. They do not mass distribute and they do not sell in grocery stores. I asked Lane what he plans to do with more grapes, "we&apos;re already licensed to make wine, beer, and liquor, we&apos;ve just chosen to focus on wine. We are moving in the direction of distilling brandy for fortified wines. In fact, the first fortified wine product hits shelves soon - called Fearless. Fortified wine means distilling an un-fortified wine and taking the alcohol from that process, which is brandy, and then adding it back into another wine." At that point, the wine goes from less than 16% to 18-20%. Legally a winery can sell wine with up-to a 24% ABV. So, what does Lane Gregory like most about making wine, since he didn&apos;t particularly start out to become a vintner? "If I can make wine, anyone can make wine," he jokes, "But, really, it&apos;s basic chemistry. And a lot of fun. I think that my years in the restaurant business gave me the ability to blend wine well and to pair the wine we make with the food we serve in the restaurant." Almost every unique wine has a creative label and person associated with it, "my wife and I visited a lot of wineries and for the most part we found that the wine had a generic or esoteric name. We wanted our wine to have a story, most are named after good friends and family members." 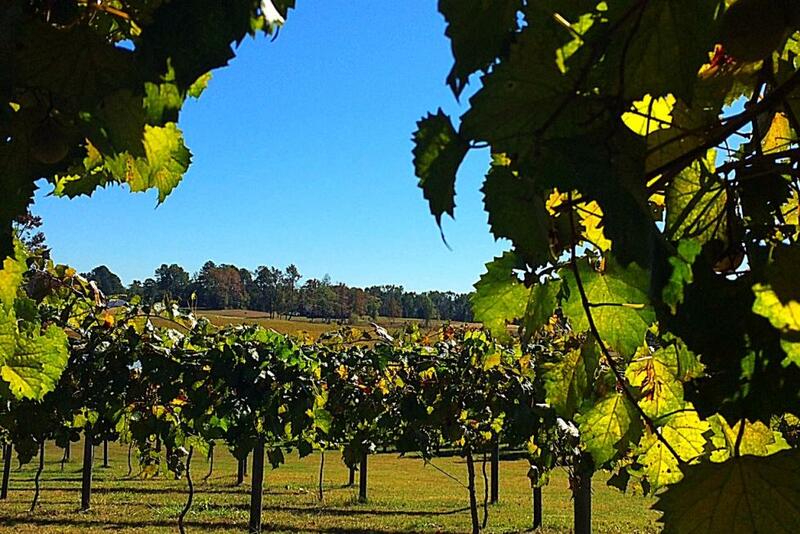 People come from all over to have dinner at Lane&apos;s Seafood & Steakhouse, and to taste the delicious muscadine wine. Gregory Vineyards gets visitors from Ohio, New York, Pennsylvania, and Flordia to name a few. Lane says a lot of them are in the area to visit family and are looking for things to do. Gregory also hosted the NC Grape Stomp Festival this year a few weekends ago and around 3,000 people attended. The vineyard also hosts weddings for most of the year now from early spring to early winter, the original plan if you remember, and did over 100 events last year. I asked what the future held and Lane said that for now, he and his wife are content to grow the vineyard and the business at a manageable pace. He hinted that there would be more initiatives to unveil very soon. Exciting! I love to see small, local business booming. Lane said that even with growth they will remain a Mom & Pop operation, "I still call it a hobby, but a hobby that works me pretty hard." If you are interested in a wine tasting, a delicious surf and turf dinner, or holding a wedding - possibly all three? 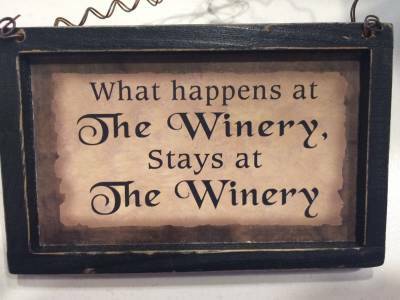 - feel free to contact Gregory Vineyards. And if you have a Saturday afternoon free, go sit a spell on the porch with one of the best views in the Johnston County. Ashby Brame is a Johnston County native who lived all over the state of North Carolina from mountains to coast, before settling back in JoCo. She loves sharing the ways in which this county is evolving into a fun visitor destination and an awesome place to call home. Ashby hopes her blogs about history, hospitality, delicious food, beer, and moonshine encourage people near and far to give JoCo a try.